A file cabinet is a piece of office furniture characterized by drawers that hold papers in vertically placed folders. While such cabinets are mainly used to store documents, they also facilitate organizing, removing, and using such documents. Since the earliest use of written records, it has been necessary to organize and store information. Ancient methods of filing included clay tablets that were kept in libraries, and leather or papyrus scrolls that were sealed in stone or earthenware vessels. Other filing methods developed later. Sometimes records were simply kept on shelves. During the late Middle Ages, clerks used spindle files. These implements—basically sharp sticks attached to bases—resembled the metal prongs on which today's small businesses might save receipts. Pigeonhole filing, in which bundles of papers were placed on shelves segmented into discrete cubicles, became appropriate for small scale, immediate access filing. In contrast, records not in daily use could be stored in boxes or trunks. People could also use a letterpress to copy receipts and letters into a copybook, and a strongbox to save valuable documents. To meet the demands of growing businesses during the late 1800s, several methods of filing were developed, among them the bellows, box, and Shannon files. These devices were noted to organize material, either chronologically or alphabetically, in small containers that could be easily opened. In 1868 the first cabinet equipped with drawers became available, but because the papers were laid flat, retrieval was cumbersome. Vertical files were introduced at the 1893 World's Fair in Chicago. Dr. Nathaniel S. Rosenau is credited with the idea, taken from the already existent vertical method of filing cards. Vertical files are the familiar file cabinets of today. The earliest models were made from wood, but these were gradually replaced by steel vertical files in the twentieth century. While file cabinets are so common and well-known that they are often considered the only or best way to file records, records management experts generally agree that vertical files are useful only for small offices or household records. Other systems include shorter, wider, vertical files; open shelf files (similar to bookcases); and electronically controlled systems. In the 1940s, the first motorized rotary card file system was invented. Motorized letter-size files soon followed, and a mechanized, horizontal, large wheel version becoming available during the 1950s. In the ensuing decade, prompted by the growing demand for large vertical or open shelf files, a system was developed by which pushing a button could bring a shelf or drawer to eye level. Card files of the time used a system of punched cards: when the appropriate code was punched in, the desired file card would emerge. More recently, electro-optical scanning has made it possible to use scanners to find properly coded folders. After being die-cut or stamped to the proper size, the steel components are pointed in an electrostatic process. The paint in the paint gun is given a positive charge, while the cabinet part is given a negative charge. The opposite charges cause the paint to adhere evenly to the cabinet surface. After painting, the components are welded together in a process known as spot welding. One electrode is placed on each part, and an electric current is passed between them. The heat generated by the current fuses the parts together. far the most common material used for business file cabinets. 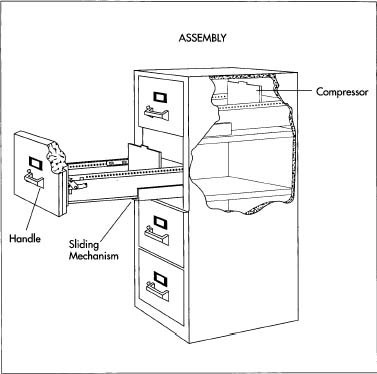 Like the case, the compressor (the adjustable mechanism that moves back or forward to hold upright a larger or smaller number of files) is also made from steel, and both are usually painted. To ensure a lasting finish, a special epoxy paint is applied electrostatically. Epoxy paint is based on a synthetic resin whose strength derives from condensation polymers, molecules that form tight chains during the condensation process. 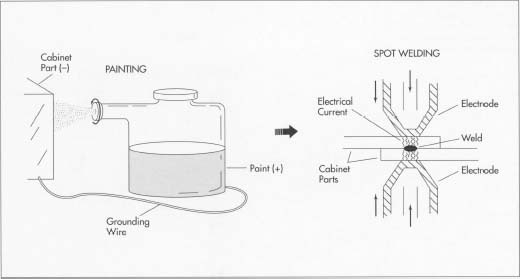 Electrostatic painting entails applying paint with one charge to an object with the opposite charge; the difference in charges causes the paint to adhere tightly to the object. The cabinet's accessories include handles and card label holders, both of which are likely to be made from anodized aluminum. The sliding mechanism and ball bearings are usually steel, while the rollers are usually made from high density nylon. Some file cabinets are built to be fireproof. Such cabinets are heavier because their walls are built with special encapsulated chambers filled with vermiculite (a lightweight, highly water-absorbent clay mineral) and several gallons of water. When the file cabinet is heated by the presence of fire, the vermiculite melts and the water turns into steam, thereby accepting the heat and keeping the documents cool. 1 The 18-gauge steel from which most components of a file cabinet are made is bought in large quantities. It can reach the factory in coils 11.8 to 15.7 inches (.3 to. 4 meter) wide, or, for larger components such as the walls of the file cabinet, in sheets of several sizes: 9.8 by 12 feet or 8 by 9.8 feet (3 by 3.66 meters or 2.44 by 3 meters). 2 To make small components such as compressors, a ribbon of steel from a coil is rolled onto a machine that cuts it with a die. To make shelves or dividers, the coils are unrolled and stamped in a press. To make the sides, top, and bottom of the file cabinet, the large sheets of steel are cut to size. Stronger portions of the cabinets, such as gussets, ribs, and end panels, are made simply by folding the steel one, two, or three times, depending on how much strength is desired, and pounding it to form thick, layered parts. A completed vertical file cabinet includes a compressor, a sliding mechanism, and a handle for each drawer. A quality cabinet will resist rust, drops, and impact. or, more often, epoxy paints are used in an electrostatic gun. This effective method disperses the paint in powdered form, yielding only one percent waste. Electrostatic painting works best in a vacuum, so a 23-inch (58-centimeter) area around the object to be painted is cleared. An aluminum wire runs from the paint gun to the cabinet in order to ground it. While the paint is given a positive charge, the component to be painted receives a negative charge. The gun then sends the paint out through a small, cupped head that rotates to cover all surfaces, even those that are not flat, evenly. After spraying, the parts are heated to secure the paint. The strong bond that forms between the differently charged paint and part results in a durable finish. 4 After being painted, the top, bottom, and sides of the cabinet are welded together. The parts are held steady in a jig, a device that resembles a vise. File cabinets are spot welded, meaning that welds are made at regular intervals between two overlapping sheets of metal. During spot welding a low-voltage, high-current power source with two electrodes, one on each side of the joint, is placed on a spot, and pressure is applied. A current is generated between the two electrodes, and the resistance of the metal to the current generates heat that bonds the two sheets together. This method is also known as electrical resistance welding. 5 The slide mechanisms on which the drawers move are usually purchased from a specialty manufacturer and placed within holders that are bolted in place within the cabinet. The drawers are then assembled. Some components, such as the latch or the card label holder, are merely slipped into pre-cut holes in the steel and clamped into place. Other parts, such as the handle, are bolted into place. A file cabinet's most obvious purpose is to store documents, but another less obvious function is to protect the documents from dust, water, light, drafts, and, in the case of fireproof file cabinets, fire. A quality file cabinet will resist rust, drops, and impact. Long, tightly packed rows of paper can weigh a lot: a full letter size file drawer can weigh approximately 260 to 310 pounds (120 to 140 kilograms). A properly built file cabinet can handle these loads. Drawer mechanisms must be in good working order throughout the lifetime of the file cabinet. The compressor must keep functioning to hold the papers tightly. The drawers must not open inadvertently, but they must open smoothly when unlatched (this requirement usually depends on the slide mechanism being lubricated twice a year). One method of testing involves the lengthy life-span of a file cabinet. The weight needed to open a drawer is determined using a spring scale. This weight is attached to the door, which is then opened and closed at least 50,000 times to simulate twenty years of use. Tolerances and dimensions are also important in making file cabinets, because, while height, width, and depth dimensions may vary slightly from manufacturer to manufacturer, the file cabinet must be built to conform to the standard folder sizes. For easy retrieval, the drawer space for folders is usually about one centimeter wider than a standard folder. Fireproof file cabinets have a rating system that indicates the temperature range within which the documents will remain protected. At minimum, the documents will be safe at 354 degrees Fahrenheit (177 degrees Celsius). Even at 1704 degrees Fahrenheit (927 degrees Celsius), the documents will be safe for an hour. The ideal climate for documents would offer temperatures between 68 and 78 degrees Fahrenheit (18-24 degrees Celsius) with relative humidity of 50 percent. The latest trend in file cabinets is their possible disappearance from computerized offices. Prognosticators of the 1960s and 1970s envisioned paperless offices in which information would be neatly stored on—and easily retrievable from—space-saving computer floppy disks and databases. However, despite the prevalence of computers, as recently as 1990, fully 95 percent of all office documents were on paper, with one million pieces of paper per minute being created in the United States alone. At the present time, computers often seem to function as merely another means of generating paper, or hard copies. This familiarity with and preference for paper documents will, at least in the near future, necessitate the continued use of filing cabinets. Arn, Joseph V. and Paula H. Titlow. Records Management for an Information Age. Delmar Publishers, 1991. Johnson, Mina M. and Norman F. Kallaus. Records Management. South-western Publishing, 1967. Stewart, Jeffrey R., et al. Filing Systems and Records Management. McGraw-Hill, 1981.